On January 31, 1947, Kol Yerushalayim (The Voice of Jerusalem) broadcast a Mandatory government announcement to the effect that, as a consequence of the recent disturbances in Palestine, it had been decided that British women and children and other British nationals whose presence in Palestine was not essential, would be evacuated. Soon after, some 1,500 men, women and children were evacuated by train to Egypt and transported from there by sea to England. In addition to evacuating women and children, the British army began constructing 'security zones' in the three large cities. In Jerusalem itself, four such zones were set up and the atmosphere in the city changed drastically. The central 'security zone' was set up near the Russian Compound. Local nationals, most of them Jews, were ordered to abandon their shops and offices, without being offered alternative places by the authorities. The entire area, which included the Generali building, the Anglo-Palestine Bank building and the central post office, was cordoned off by barbed wire fences and entrance was by identity card only. The police often conducted body searches of citizens who wanted to enter the fenced area. The area opposite the Yeshurun synagogue was also cordoned off, and became a 'security zone', which included the officers club in Goldschmidt House and the adjacent military depot. Additional security zones were located in the Talbieh quarter, in parts of Rehavia and the Schneller camp. The security zones (or 'Bevingrads', as the local population called them) soon became 'internment camps' for British soldiers and policemen, who were permitted to leave only when on duty. Places of entertainment (which were all outside the security zones) were now 'out of bounds' to the British, and contact with the civilian population gradually dwindled. The atmosphere in the Yishuv was increasingly anti-British. This was largely due to the attitude of the British authorities towards the Jewish population, and their brutal treatment of the immigrants brought from Europe by the Haganah. In that period, the Haganah stepped up its activities, and the number of illegal immigrant vessels was increased. However, in most cases the ships did not succeed in breaking the British naval blockade on Eretz Israel, and the immigrants were intercepted, and taken aboard British vessels, which conveyed them to internment camps in Cyprus. Those immigrants who resisted were taken by force and many of them were injured in the struggles. This brutal treatment of defenceless people, who had come from the European graveyard to seek refuge in Eretz Israel, aroused a storm of protest in Palestine and throughout the world. The Irgun was not slow to react, and the underground struck even more heavily at the British. Military targets were attacked throughout the country, and in Jerusalem plans were completed for an assault on the Officers' Club at Goldschmidt House on King George Street. On Saturday, March 1, 1947, some 15 members of the Jerusalem Fighting Force assembled at the Alliance girls' school. The school janitor, who was collaborating with the underground, left the gate open and made all necessary arrangements so that the Irgun fighters could hold their meeting uninterrupted. The attack had been scheduled for Saturday, at a time when the streets would be empty, in order to avoid civilian casualties. After the briefing, the fighters were given weapons and the combat unit received British army uniforms as a disguise. After the preparations were completed, the convoy set out, headed by a taxi with three fighters. It was followed by a van carrying the five-man combat unit, headed by Dov Salomon (Yishai). It had been agreed in advance that if the road was open, the taxi would halt briefly, and this would be the signal to start the operation. If, however, the taxi drove on without halting, this would mean that the road to the Officers' Club was not clear. When the taxi reached the location, several army trucks were parked outside the club, and it drove on without stopping, followed by the van. The combat unit was forced to circle the area three times. Finally Yitzhak Avinoam (the District Commander, who was waiting nearby) gave the order to attack. One unit took up position beside the Yeshurun synagogue, opposite the Officers' Club, and aimed a Bren gun at the neighboring building to prevent the British soldiers stationed there from disrupting the operation. An additional unit took up position on King George Street with the task of maintaining a fusillade which would prevent passage of vehicles. The van drove rapidly, broke through the barbed wire which surrounded Goldschmidt House and halted in the courtyard close to the entrance. The guards went over to the car and asked for an entry permit. In response, the fighters opened fire and all the units went into action. The three sappers entered the building under cover of the gunfire, carrying with them three rucksacks containing 30 kilograms of explosives each. Salomon placed the rucksacks beside the building's supporting pillars, and after igniting the fuse, gave the order to retreat. The sappers ran towards the door, but one of them suddenly remembered he had left his revolver on the rucksack and started back to fetch it. His comrade pulled him by the sleeve, and together they managed to exit the building in time. They continued to run towards the Ratisbonne monastery (which lies behind the Yeshurun synagogue), and slipped through an opening in the fence which had been prepared in advance. In the Ratisbonne courtyard the weapons were thrown into a sack brought by the Irgun girls, and the fighters took off the British uniforms. They made for the Nahlaot quarters where they dispersed. At 3:30 PM, there was a loud blown up, and the Goldschmidt House collapsed. Seventeen British officers were killed in the explosion - among them several senior intelligence officers - and 27 injured. The reaction in Britain was reported by the Haaretz correspondent in London: SHOCK IN LONDON The attack in Jerusalem came as a shock to London at the weekend. The evening papers produced special editions with banner headlines as each new item of information was received. The attack reminds everyone of the King David affair. The press stresses that this is the first time the terrorists have perpetrated an attack on a Saturday, and emphasize that it took place inside the security zone. The 'Sunday Express' printed a banner headline: "Govern or Get out". The blowing up of the Officers Club in Jerusalem was the culmination of a series of attacks on British targets all over the country. A number of military vehicles were mined on interurban roads; army depots at Hadera, Pardes Hanna and Beit Lyd came under mortar and machine-gun fire; and in Haifa, an army vehicle lot was attacked and 15 vehicles were destroyed. In the course of these operations, dozens of British soldiers were killed and injured. The reaction to the March 1 operations was swift. The same evening, Kol Yerushalayim (The voice of Jerusalem) broadcast an official announcement, stating that the High Commissioner had decided to impose martial law on the Jewish quarters of northern Jerusalem and on the districts of Tel Aviv, Ramat Gan, Bnei Barak and Petah Tikva. In Jerusalem, the operation was code-named 'Hippo' and in Tel Aviv 'Elephant'. The operation had been planned meticulously several months before, and the High Commissioner had been empowered to put it into effect at his discretion. More than 20,000 British troops took part. The introduction of martial law came as no surprise; the High Commissioner had told the leaders of the Yishuv several times that if they did not resume full collaboration with the authorities in the fight against the underground organizations (as they had done during the Season), he would introduce draconian restrictions, and even proclaim martial law in Jewish areas. Although the heads of the Jewish Agency feared the destruction of the Zionist endeavor in Eretz Israel, they did not accede to the High Commissioner's demand. Betrayal of Irgun fighters to the British was now carried out on a more limited basis, subject to the decision of the highest echelons of the Jewish Agency. Under martial law, all the powers of civilian government were transferred to the military. Civilian courts were replaced by military tribunals, empowered to hold rapid trials; post offices were closed and public and private transport immobilized. Use of telephones was restricted, and special permission was required for opening banks. Soldiers were granted policing powers, and were authorized to arrest suspicious individuals, and to shoot curfew breakers. Indeed, immediately after martial law was proclaimed, two Jews were shot and killed, one of them a four-year-old girl standing on the balcony of her home in the Mea Shearim quarter. The entire zone was closed to traffic and special permits were required for entry or exit. The British set themselves two objectives in proclaiming martial law: firstly, to bring underground activity to a halt, since they believed that it was focused in the closed areas, and secondly, to undermine the economy of the Yishuv and thereby force the leaders of the Jewish Agency to resume their cooperation with the British against the Irgun and Lehi. It was soon manifest that the population was adjusting rapidly to the new situation. Improvisation skills were brought into full play; in the absence of buses, horse-drawn carts carried passengers to their destinations. Many people rode bicycles, while others simply walked. As time passed, the British were forced to permit the supply of foodstuffs to the areas under siege, and the number of transit permits was extended. From time to time, the curfew was lifted in the areas under martial law, and the population was permitted to purchase food. At these times, crowds assembled on both sides of the barbed wire, and soldiers helped to pass parcels from one side to the other. Yosef Avni, who was in charge of the Irgun's arsenals in Jerusalem, relates that in order to prepare the attack on the Schneller camp, it was necessary to bring weapons out of the closed area. He instructed the storeman to load grenades and revolvers into a sack. One of the soldiers on guard then helped lift the sack over the barbed wire fence and handed it to Avni, who was waiting on the other side. The Irgun General Headquarters decided to step up onslaughts against the centers of British government. All district commanders were ordered to take action within their areas of jurisdiction without awaiting special permission from the General Headquarters. In the first week of martial law, various targets were attacked outside the closed areas; mines were laid daily on interurban roads to damage military vehicles; army depots came under mortar and rifle fire. 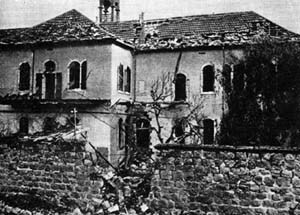 In the second week, the Irgun and Lehi began to raid military targets inside the closed areas. The Lehi attacked Hadar House in Tel Aviv (one of the headquarters of the British forces), and the mobile police camp at Sarona. The strikes against military transport continued and the British-Iraqi petroleum pipeline was blown up. The Irgun's military activity during the period of martial law culminated in the attack on Schneller camp in Jerusalem. The Schneller Syrian Orphanage was founded in 1860 by Father Johannes Ludwig Schneller, who came to Jerusalem from Germany as a Protestant missionary. At first, the institution took in children orphaned by the Druze massacre of Christians in Lebanon and Syria. In time, the compound grew and was walled in, and after the Second World War it became a closed army camp. Schneller camp was located in the area under martial law. The camp was, in fact, at the heart of one of the security zones, and its surrounding wall had firing positions at its corners. 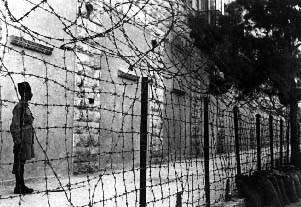 All access roads to the camp were surrounded by barbed wire fences, and a large number of troops guarded the entire area. Because of the shortage of explosives, not all the barrels were full. It was assumed that the warning notices alone would deter the British troops from taking unnecessary risks. In fact, the gamble succeeded and they did not dare risk shifting the barrels. Having completed their task, the two squads rapidly left the scene. A third squad, under Gal, was assigned to security. The squad took up positions in a building which overlooked the entrance to Schneller camp, with the task of preventing soldiers from coming out of the camp by firing automatic weapons at the gate. The fourth squad, under Yosef Avni, consisted of five fighters, each carrying a rucksack containing 30 kilograms of explosives. Under cover of darkness, they reached the stone wall surrounding Schneller camp and hid behind a nearby fence. They then broke through the camp wall, and crawled through the opening into the camp. After breaking into the first building under cover of tommy-gun fire, Avni lit the fuses of the mines and retreated. While he was crawling back, there was a loud explosion. The blast hurled him against the wall, stunning him momentarily. As soon as he reached the rest of the unit, the group withdrew to the area outside martial law, hid their weapons and dispersed to their homes. One British soldier was killed in the attack and eight were wounded, three seriously. The incident was reported in Ha'aretz : GREAT CONFUSION After the explosions, warning sirens went off in Jerusalem and there was a volley of gunfire. Almost all the soldiers in the military zone fired repeatedly. There was considerable confusion and the shooting was random. While this was going on, the attackers slipped away. The firing continued for more than half an hour. There was no loss of life in the civilian population inside the military zone. The explosion in Schneller camp made a strong impression on the local and world press, and severely undermined the prestige of the British administration. It offered resounding proof that the British were unable to check the Jewish underground, which was operating in small units and effectively exploiting the element of surprise. 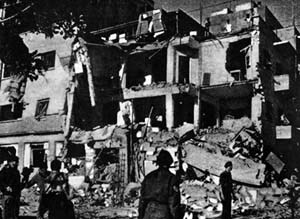 On the night of the Irgun raid on Schneller, several additional targets came under attack throughout the country: an army camp near Karkur was raided, shots were fired at the Sarona camp and a landmine exploded near Rishon Lezion. Martial law, which lasted 16 days, was revoked on March 17 (four days after the attack on Schneller). In all, 78 persons 'suspected of membership of terror organizations' were arrested throughout the country - a tiny number in view of the scope of the operation. Martial law was a total failure; the British did not succeed in suppressing the underground organizations. The Government Information Service announced that during the period of martial law, 68 'terrorist acts' had been committed, 4 per day on average. The leaders of the Jewish Agency did not revert to widescale informing on Irgun and Lehi fighters. The threat which had hovered over the Yishuv for so long had now receded. The most drastic weapon the British could wield had proven ineffective, since the Yishuv had easily adapted itself to the new situation. The underground movements emerged from the crisis stronger than before and with enhanced prestige. The attack on the British Officers' Club and the debacle of martial law motivated the opposition in Great Britain, under Winston Churchill, to re-double its denunciations of government policy. In one of his speeches, Churchill declared: How long does the Secretary of State for Colonies expect that this state of squalid warfare will go on, at a cost of 30 or 40 million pounds a year, keeping 100,000 Englishmen away with the military force? The Sunday Express wrote that: the Palestine problem has to be solved and solved at once. British lives are being sacrificed with no objective, and terror was undermining British prestige throughout the world. As a result of underground activities in Palestine, His Majesty's Government was forced to bring forward the debate on Palestine at the United Nations. A special session of the UN was scheduled for April 28, 1947, instead of the later original date, in September.